Latex is an all natural rubber material which is extracted from the rubber tree in comparison to sap from a maple tree. Once extracted, it is molded to a form which is utilized in mattresses. Our natural Talaly latex mattress is 4 times more breathable then synthetic foams. 3 times more durable. 33% more pressure relief, and contours while maintaining the Hypoallergenicbenefit. 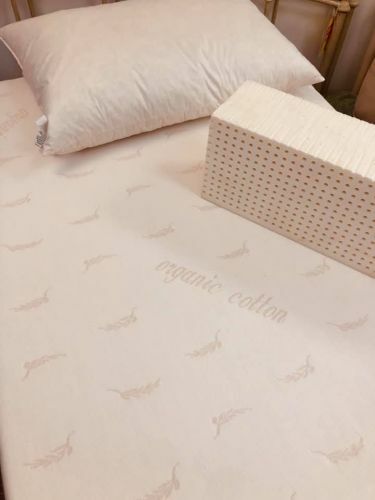 Covered in an organic soft knit material, the latex mattress provides contouring while supporting. Each Latex Mattress is Double Sided for flipping so as to provide you with a longer lasting lifespan. Finish mattress height 6"-7" thick. Eco Friendly, Green, Healthy Mattress.